This meal is actually very easy. You will be surprised that you can make something so elegant with hardly any effort. It's also delicious in every way. 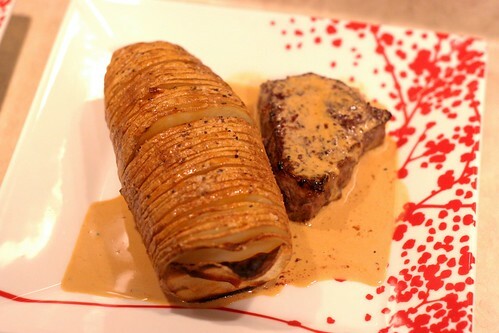 The steak is super tender, the pan sauce is creamy and rich, and the potatoes are crispy and buttery. Does it get any better? I made this for our Valentine's Day dinner last night. It was a big hit with the boyfriend, who is a true meat and potatoes lover. By the way, how hysterical is this potato? I knew I wasn't serving an appetizer or any other side, so I wanted what little I was making to be filling. So I bought 2 of the most ginormous potatoes I could find. They look monstrous compared to a tiny filet. So first you want to bake the potato. 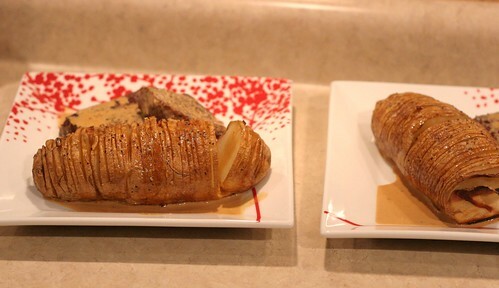 Hasselback potatoes are new in my life, I discovered them on Tastespotting a few months ago. You can take a plain old potato and make it super fancy. Start by cleaning the potatoes, because you're going to be eating the skin. Then slice off a small portion of the bottom, just so it sits evenly while you slice and bake it. 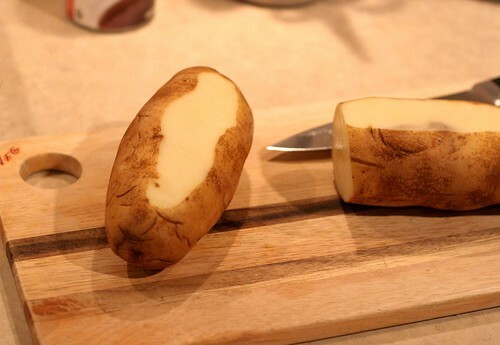 Work your way down the potato with a sharp knife, cutting thin slices about 3/4 of the way through. Leave it attached at the bottom. Put the potatoes on a baking sheet lined with foil. Drizzle a generous amount of olive oil, salt and pepper. I sliced up 2 garlic cloves and fit the slices into the potato, as you can see above. This adds a nice roasted garlic flavor. I disposed of the burnt cloves before I served the potatoes. Now your side dish is done. It look like 5 minutes to prepare and after an hour in the oven, you have a crispy, delicious potato. I think I will make this all the time. Next comes some beautiful filets. I love this cut of meat. It's so tender and low in fat. Start by heating up an oven safe skillet on high heat. Melt some butter and coat the steaks in salt and freshly ground black pepper. Traditionally, steak au poivre uses peppercorns. Sear the steaks for about 1-2 minutes on each side, until you are confident there is a nice crust. To achieve this, don't move the steak while they are searing, only to flip them. It's a beautiful thing when you turn them over. I saw the above and I yelled from the kitchen, "MOM COME LOOK AT THIS!" Stick them in a 400 degree oven for a few minutes to finish cooking. The pan sauce is easy too. 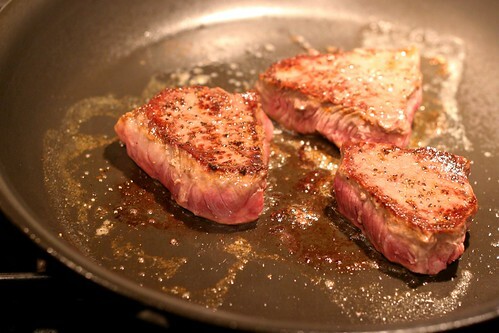 Immediately take the steaks out of the pan when they are done. Put the pan back on low heat, it will be hot from the oven so be careful. Swirl around a tablespoon of butter while scraping the bottom of the pan with a whisk. Add dijon mustard, beef broth and cream. Whisk it and try to stop drooling. Then spoon the sauce over both the steak and the potato. It's out of control. Preheat oven to 400 degrees. Heat up an oven safe skillet over high heat. Melt 1 tablespoon butter in skillet. Sprinkle steaks with salt and pepper, then sear steaks about 2 minutes on each side. Place skillet in hot oven for 5 to 6 minutes to finish cooking, for medium well. Remove from the oven and immediately put the steaks on a separate plate and set aside to rest. Put the skillet over low heat. Add 1 tablespoon butter and stir with a whisk to scrape bits off the bottom of the pan. Add dijon mustard and whisk. Add beef broth and heavy cream. Season with more salt and pepper. Whisk everything together until the sauce bubbles up and thickens. Remove from heat and pour over steak. Preheat oven to 425 degrees. Scrub potatoes. Slice a small section off the bottom of the potatoes to give them stability. Slice each potato into thin slices, about 3/4 of the way through leaving the bottom attached. Slice garlic into thin slices. Slide the garlic into several layers of the potato, being careful not to split the bottom. 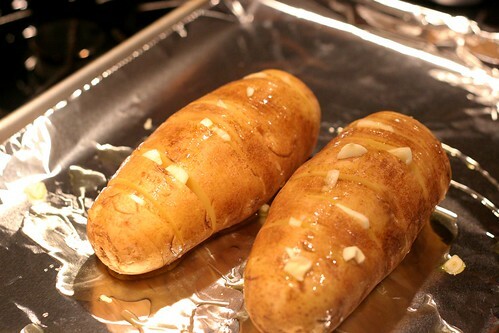 Place potatoes on a baking sheet lined with foil. Drizzle generously with olive oil, salt and pepper. But 1 tablespoon of butter on each potato. Place in the oven and bake for 1 hour. 30 minutes through the cooking, drizzle the potatoes with olive oil again. This will make sure it has crispy skin. Cool for 5-10 minutes before serving. How sweet! Looks so perfect for valentine's day. I absolutely love those gigantic potatoes by the way - looks delicious and filling! It was difficult living in the house and smelling this awesome dinner and not being able to eat it! We had leftover pancakes and fruit and yogurt...here lies the difference in being married for 27 years and dating! LOL!